In partnership with MAN Energy Solutions, the Alfa Laval Fuel Conditioning Module (FCM) LPG has undergone successful tests with the first two-stroke, high-pressure marine engine to use LPG as fuel – and has been evaluated for use with ammonia. The competitiveness of LPG as a fuel is increasing. Not only does LPG virtually eliminate sulfur emissions, it has a lower cost than many other fuels and is readily available worldwide. For these reasons and others, MAN Energy Solutions has developed the new LPG-fuelled MAN B&W ME-LGIP marine engine. Alfa Laval, having successfully provided fuel boosters for the first methanol-fuelled chemical tankers, was selected as the ideal partner to develop, supply and test the engine’s low-flashpoint fuel supply system (LFSS). The resulting booster system, the Alfa Laval Fuel Conditioning Module (FCM) LPG, is the first proven solution to provide LPG to a high-pressure combustion engine for marine applications. Compared to methanol, LPG must be pumped at a higher supply pressure in order to avoid phase changes and to deal with a wide composition spectrum. 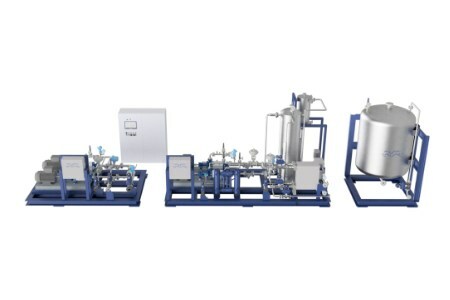 Alfa Laval designed the system not only for robustness, but also to function optimally under the full range of process conditions. To deliver LPG at the 53 barg pressure the engine requires, the FCM LPG incorporates new pumping technology and effective high-pressure heat exchange, which are built into low-pressure and high-pressure skids. The latter of these has a filtration stage comprising two independent chambers, which allows it to be serviced with the system in continuous operation – a setup derived directly from the booster experience with methanol. Equally critical is the new automation and control system, which matches the LPG flow to fluctuating engine load without unnecessary heat input from the pumping and flashing of light fractions in the LPG. An additional key feature of the FCM LPG is its LPG recovery function, which provides full liquid LPG recovery and partial LPG gas recovery when the engine or fuel valve train is purged. Recovering LPG rather than fully venting it to atmosphere is more than just economical. In tests performed in Denmark at the MAN Energy Solutions Research Centre Copenhagen, the FCM LPG prototype has been shown to meet – and even exceed – the fuel supply requirements of the MAN B&W ME-LGIP engine. Tests with the fuel valve train and a simulated engine load began in 2Q18, followed by online tests using the facility’s 4T50ME-X prototype engine in 1Q19.